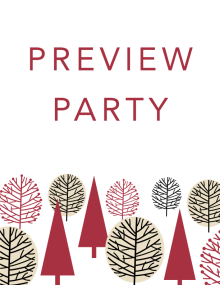 Join us for festive food, drinks, and tax-free shopping at our Holiday Preview Party, the opening reception for our Holiday Gift Show! Be the first to shop the show, which features countless works of fine art and unique artisan wares from local and regional artists. Kick off your holiday season as you mingle with friends and enjoy catering by GoFish Restaurant. The Holiday Gift Show includes items such as: hand carved wooden spoons, bowls and cheese boards, candles, jewelry, sailor bracelets, paper trees, stoneware pottery, notecards, fiber items, natural soaps/balms, stained glass, hats, silk scarves, neckties, ornaments, fine art and more. All purchases are tax-free during the Preview Party.